The beauty of the shapes and patterns created by meandering rivers has long attracted the attention of many geomorphologists, civil engineers, and sedimentologists. Unless they are fairly steep or have highly stable and unerodible banks, rivers do not like to follow a straight course and tend to develop a sinuous plan-view pattern. The description and mathematical modeling of these curves is a fascinating subject, but that is not what I want to talk about here and now. It is hard enough to understand the plan-view evolution of rivers, especially if one is interested in the long-term results - when cutoffs become important -, but things get really complicated when it comes to the three-dimensional structure of the deposits that meandering rivers leave behind. The same can be said about sinuous channels on the seafloor, created and maintained by dirty mixtures of water and sediment (called turbidity currents). An ever-increasing number of seafloor and seismic images show that highly sinuous submarine channels are almost as common as their subaerial counterparts, but much remains to be learned about the geometries of their deposits that accumulate through geological time. 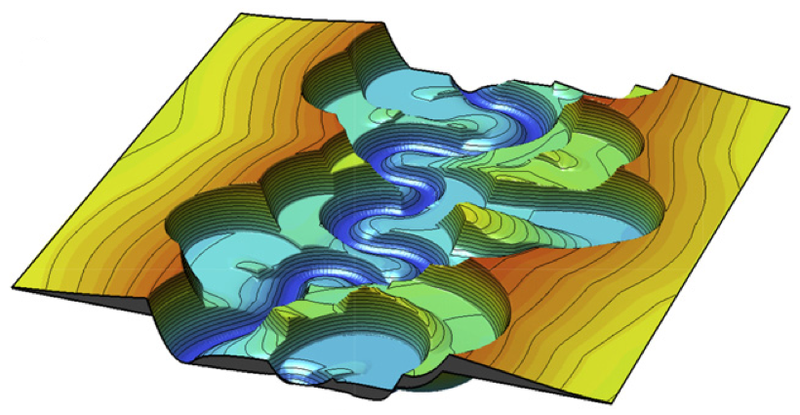 Using simple modeling of how channel surfaces migrate through time, two recent papers attempt to illustrate the three-dimensional structure of sinuous fluvial and submarine channel deposits. 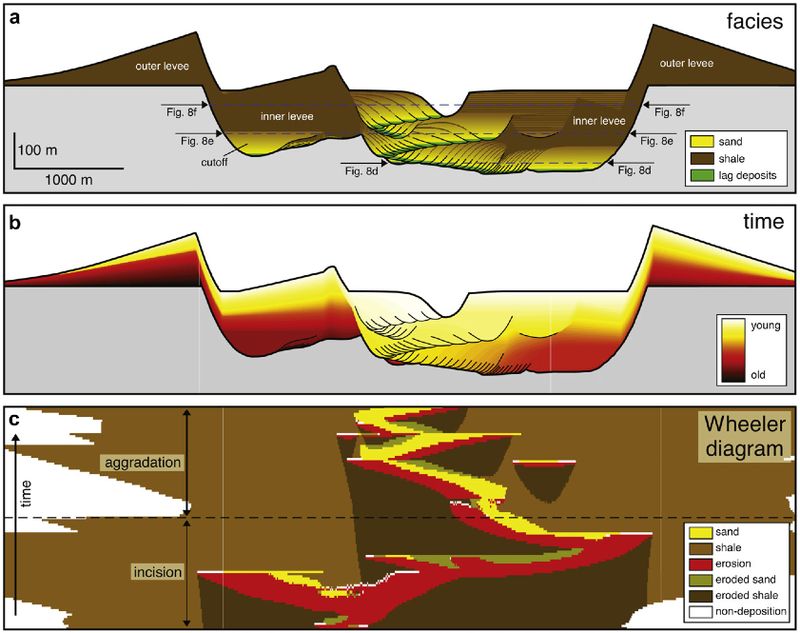 In the Journal of Sedimentary Research, Willis and Tang (2010) show how slightly different patterns of fluvial meander migration result in different deposit geometries and different distribution of grain size, porosity and permeability. [These properties are important because they determine how fluids flow - or don't flow - through the pores of the sediment.] River meanders can either grow in a direction perpendicular to the overall downslope orientation, or they can keep the same width and migrate downstream through translation. In the latter case - which is often characteristic of rivers incising into older sediments -, deposits forming on the downstream, concave bank of point bars will be preferentially preserved. These deposits tend to be finer grained than the typical convex-bank point bar sediments. In addition to building a range of models and analyzing their geometries, Willis and Tang also ran simulations of how would oil be displaced by water in them. One of their findings is that sinuous rivers that keep adding sediment in the same area over time (in other words, rivers that aggrade) tend to form better connected sand bodies than rivers which keep snaking around roughly in the same horizontal plane, without aggradation. The second paper (Sylvester, Pirmez, and Cantelli, 2010; and yes, one of the authors is also the author of this blog post, so don't expect any constructive criticism here) focuses on submarine channels and their overbank deposits, but the starting point and the modeling techniques are similar: take a bunch of sinuous channel centerlines and generate surfaces around them that reflect the topography of the system at every time step. However, we know much less about submarine channels than fluvial ones, because it is much more difficult to collect data at and from the bottom of the ocean than it is from the river in your backyard. The result is that some of the simplifications in our model are controversial; to many sedimentary geologists, submarine channels and their deposits are fundamentally different from rivers and point bars, and there is not much use in even comparing the two. Part of the problem is that not all submarine channels are made equal, and, when looking at an outcrop, it is not easy - or outright impossible - to tell what kind of geomorphology produced the stratigraphy. In fact, the number of exposures that represent highly sinuous submarine channels, as observed on the seafloor and numerous seismic images, is probably fairly limited. 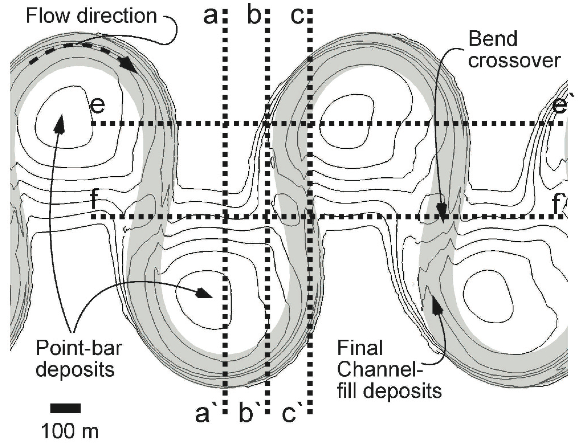 One thing is quite clear, however: many submarine channels show plan-view migration patterns that are very similar to those of rivers, and this large-scale structure imposes some significant constraints on the geometry of the deposits as well. That being said, nobody denies that there are plenty of significant differences between real and submarine 'rivers' [note quotation marks]. 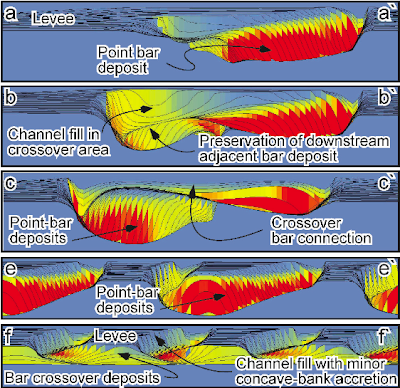 A very important one is the amount of overbank - or levee - deposition: turbidity currents often overflow their channel banks as thick muddy clouds and form much thicker deposits than the overbank sediment layers typical of rivers. 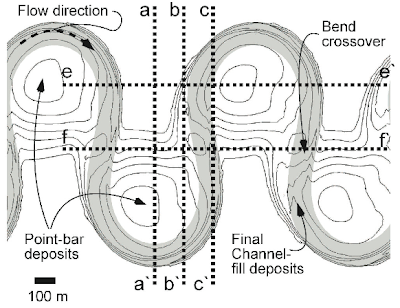 When these high rates of levee deposition combine with the strong three-dimensionality of channel migration, complex geometries result that are quite tricky to understand just by looking at a single cross section. PS. As I am typing this, I see that Brian over at Clastic Detritus is also thinking about submarine channels and subaerial rivers... Those channels formed by saline density currents on the slope of the Black Sea are fascinating.